The wonderfully alliterative name of Fred Frith is one I have been aware of for many, many years (which is perhaps more than can be said of the ticket printers for this gig, who spelt the name FIRTH). I knew he had been a member of the experimental seventies band Henry Cow, and would also see his solo album Guitar Solos regularly name-checked in the NME around that time. But had never actually heard any of his music. It was only with the advent of the wonderful internet that I was able to investigate Frith’s work from the comfort of my own study, where I discovered he really has enjoyed a marvellously eclectic career. After Henry Cow’s dissolution in 1978 he immersed himself in avant-garde/improvisation music, but not too deeply to prevent him releasing a forgotten post-punk influenced delight Cheap at Half the Price in 1983. He still performs regularly, in addition to holding down the post of Professor of Composition at Mills College, California. 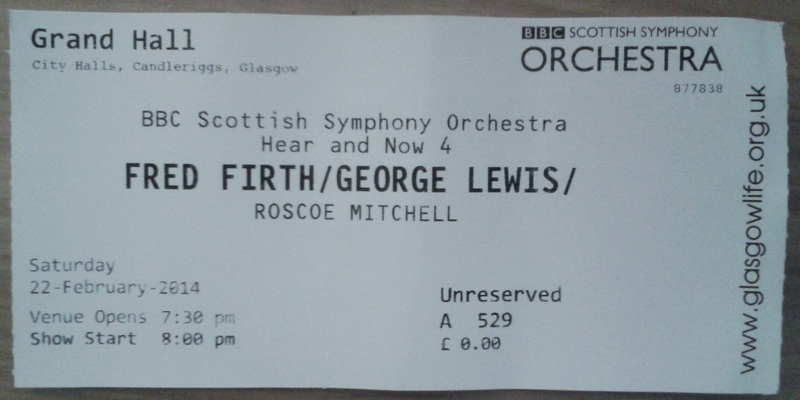 This gig was not all Frith this evening, for he was sharing the bill with a pair of equally left-field musicians: trombonist George Lewis and saxophonist Roscoe Mitchell, both black Americans. 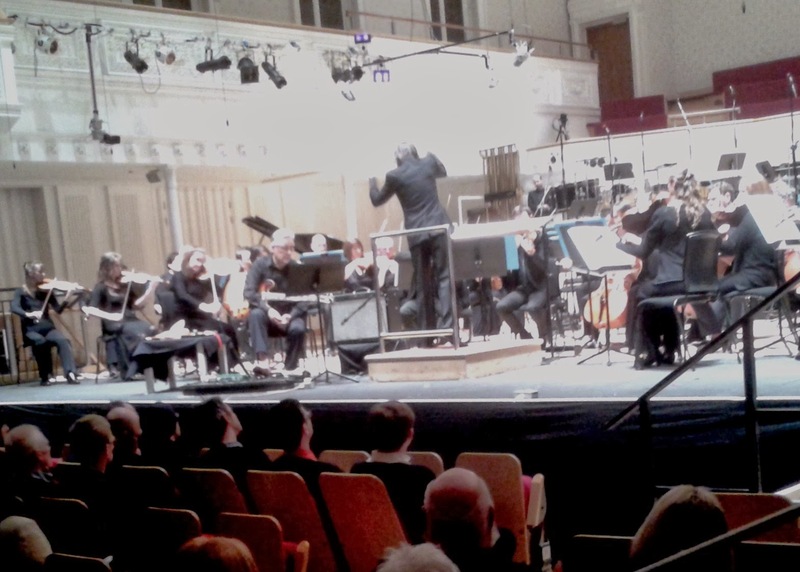 All were to have one of their orchestral compositions performed by the Scottish Symphony Orchestra, with a 20 minute improvisational set by the trio thrown in for fun. I had no real idea what to expect from these orchestral pieces, but as Mitchell’s NONAAH progressed I was rather relieved at how….well, almost mainstream it sounded. After a percussive opening, the brass section took over and thing produced passages which recalled Pink Floyd’s Atom Heart Mother in spells. The strings then came in, and it was all really rather listenable. Frith’s contribution The Right Angel was next, with the man himself playing along on guitar. Looking like your favourite eccentric Uncle Boab, he ambled on to the stage barefoot – he prefers to manipulate (or should that be footipulate) the various floor pedals with his toes apparently. He had made a witty contribution to the programme, relating how the first time he had played guitar with an orchestra, the back row musicians had made a protest by placing their fingers in their ears. Initially I thought Frith had taken this criticism to heart, as for the first few minutes his guitar parts were totally inaudible. But he soon kicked in. His guitar style really is quite unique. Sometimes holding his guitar in a conventional manner and sometimes laying it flat across his knees, he proceeded to make all manner of weird and wonderful contributions to the performance. He complimented his finger-picking and plectrum work by utilising (and I am not making this up) such unlikely items as paintbrushes, a tea-towel, a clothes brush, a violin bow, some circular metal cookie-cutter type thingy, what looked like a mobile phone, and a fistful of rice grains. This latter making a hell of a mess on the stage. He also used a couple of red chopsticks, wedging one between the strings and the fret board whilst using the other to tap the first to fine effect. At one point he dropped one of the sticks and failed to notice it plinking off the stage, which resulted in a subsequent panicky search when it was next required, before Frith was rescued by a member of the audience returning it. 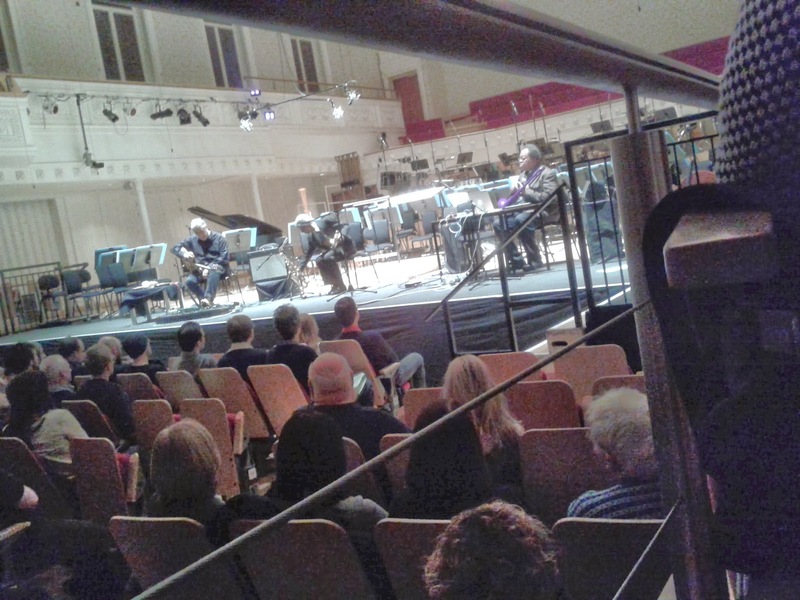 The orchestra complemented Frith's guitar well I felt, without either element being too intrusive; although we all jumped when a percussionist at the rear poured what sounded like a tray full of cutlery onto a tin sheet. I think it was intended. 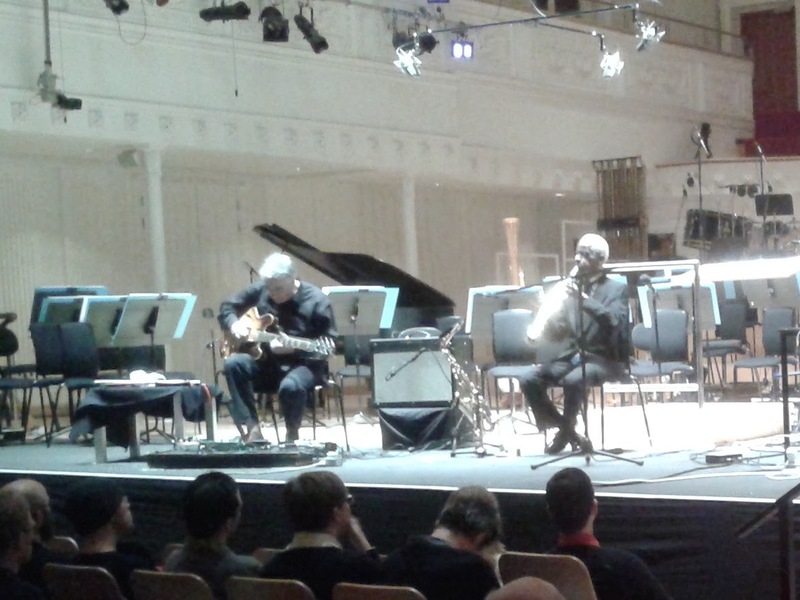 Fred Frith & The Scottish Symphony Orchestra performing "The Right Angel". During the brief interval, I attempted to the engage the elderly lady sitting next to me in a constructive deconstruction of what we had just heard, but to little avail. “Didnae like it at all", was I could prise from between her thin, bloodless lips. Quite what she made of the subsequent improvisational piece, I cannot imagine. My only real previous experience of improvised music is limited to various King Crimson live recordings where the outcomes were, at best, mixed. At least on those outings Robert Fripp and his partners in crime at least appeared to be taking cognisance of what their band mates were playing. Here, at times, all three guys just appeared to be ploughing their own furrows, irrespective of what was going on around them. Mitchell, an elderly pencil-thin dapper chap with silver hair, had started things off repeating a series of high-pitched wheezy, squeaking sounds from a soprano saxophone, which I just found profoundly irritating. It sounded like a lamb having its testicles squeezed; Frith and Lewis seemingly content to lurk in the background at this point. I then groaned inwardly as Mitchell put down his soprano and reached for a sopranino, and we endured more of the same, but at an even higher register: someone had taken an even firmer grip on poor Larry the Lamb. Lewis’s contribution throughout the improv was perhaps best described as admirable restraint. He spent much of the time pressing keys on a lap-top to introduce almost ambient background droning to the business, only occasionally stopping to pick up a purple (yes, purple) trombone and interject a few farting noises into the performance. But once Mitchell picked up an alto sax and Frith took over, I thought this is really good. I could listen to this all evening. And then they stopped!! Whit? That was never 20 minutes, just now!! I felt cheated. 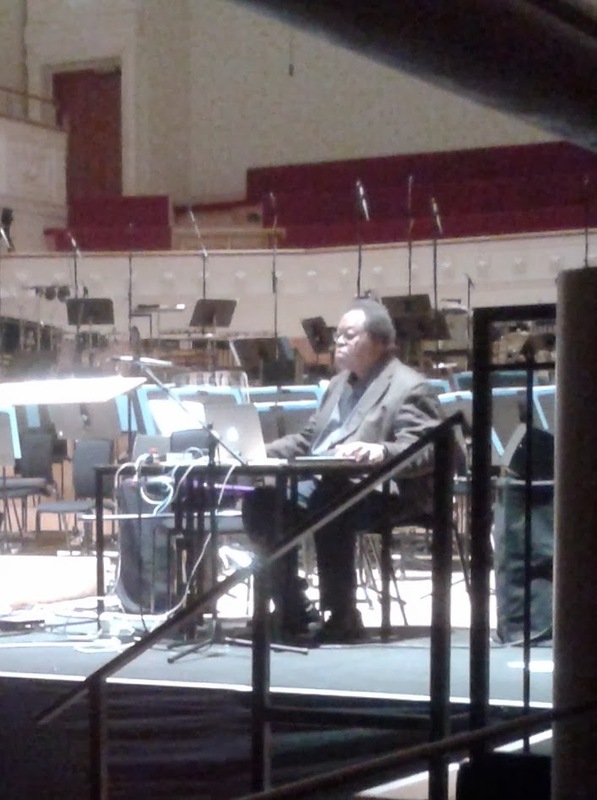 The evening closed with a rendition of Lewis’s new composition Memex (a world premier!). Given his subdued contribution to the improv, I was intrigued to hear what this would sound like. But it turned out to be all I had feared I may have had to endure with the avant-garde. Discordant, dissonant, atonal, with the orchestra at times sounding as if they were each playing a different piece of music. And it did set me to wondering what these clearly very talented and accomplished members of the Scottish Symphony Orchestra truly thought of this stuff. Presumably raised on the delights of Mozart, Schubert, Schuman et al, here they were being asked to make a noise like some crows being strangled. “Take the money and run”, I am guessing was going through the heads of more that a few. Having said that, scanning the audience around me I could see most of not all were listening enraptured, including Mr Frith sitting across the main hall from me. And the piece received a huge acclaim at its conclusion – so what the hell do I know. What I do know is I really enjoyed Big Fred’s contributions this evening, but those of the other chaps’ rather less so. 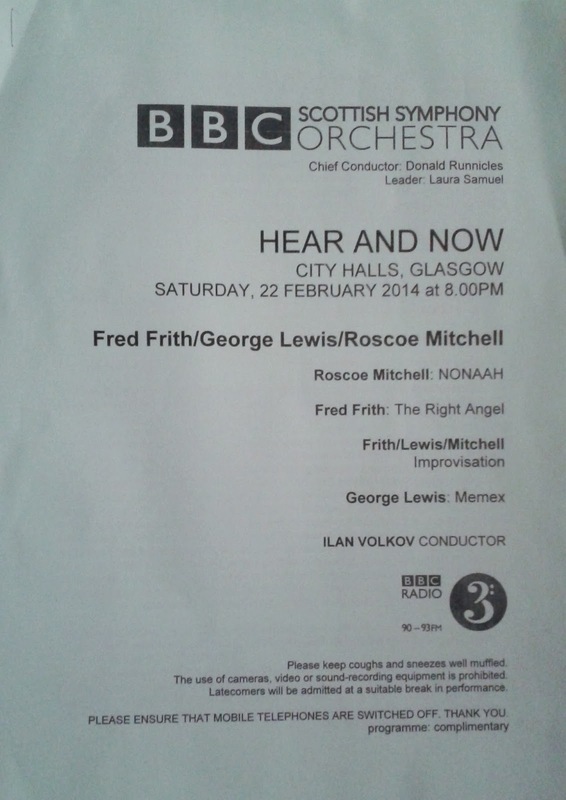 And you can make up your own minds, if you wish, for the concert will be broadcast on BBC Radio 3 on 19th April 2014. The Grand Hall, City Halls, Glasgow.